I am torn between getting a bike or a Kadudu. With a bike I will get to where I need to be in good time but with the anarchy that is Thika and Jogoo road, two wheels do not seem plausible. A Kadudu is perfect for all weather, however, depending on his mood, Henry Rotich might make it hard for me to adequately budget for fuel. Whichever way I go, I need to save as there is no chance on God’s green earth I will Ngirita my way out of this one and still carry my grandmother’s name. One of the perks of using public transport is the chance to walk to as many places as possible. There a steep hill that makes my seven minutes’ walk from the bus stop to the office a leg day. Also there is a Caucasian woman who walks her dogs every weekday at the same time in the most comfortable outfits. I often admire her, wondering if I would be game to trade lives. It’s mostly how the poodle looks at me, like it wants me to catch up with them. The bigger Old English sheepdog does not enjoy the walks at all. Head always down walking hurriedly in front its owner. Say what you will, even though she walks with earphones and has no leash for the dogs, her commitment is both admirable and enviable. Before you come after me, I need to say this, animals are like (not equal to) children. You feed them, clean them, pick up their poop and sometimes they hide under the seats – in my case, under trees. Now you can go ahead and sue me. When I say in my case, I’m talking about the little puppy I rescued that was on the verge of dying. For three weeks the little sucker had the nerve to side eye me and sleep all day. She is all grown now, and it is a delicate operation to choreograph how to get in the house without her tearing my clothes. I do not take her for walks because I will not have a nganya hit my dog in the name of him needing air. They can jump around the compound and get all the air they want. I am in the compound as well so that counts for something. Also there is a lot of construction going on around my home and Jackton, a colleague at work, scared me into paranoia over my dogs (she has a half-sister). What if something giant falls on them? A small piece of scaffolding or a carelessly loosed hammer would the pup right back to the edge of glory where I found her. But do animals go to heaven, or do we find the version 2.0s there, but not the original? Jackton isn’t sure, and that makes me paranoid. I asked him, because he’s a pastor. He has a show, ‘Prayer Circle’ where he prays with people without missing a day. Ever smiling, ever courteous, and on a good day, he will make a cup of tea and bring it to your desk. The one and only time he was gloomy was when he had a stomach upset courtesy of a food place, an upgraded kibandaski. It was so bad we almost went to his house but no, after a couple of hours he showed up, smiled and shook hands with everybody. The food placed closed in a fortnight. I told you he is a pastor. For someone who does not care for animals, it is surprising that he absentmindedly wonders what will happen to the dog. I dare not laugh, and his remorseful eyes act as a restraint. If he, a pastor who does not care for pets is worried about a stray dog walking near a construction site, you have no excuse. It’s not just the dogs, cats, parrots, rabbits (though these ones are attended to with tender love and care, and are only to be eaten in December) and hamsters for the cool kids; even those that you do not see every day need your undivided attention. There needs to be credit given, though, for all the work done for the animals Kenyans don’t see every day, and take for granted, obviously, with or without the construction sites present. And I’m not just talking about Jackton’s prayers. Images of people patting an elephant at the David Sheldrick Wildlife Trust have not gone unnoticed. I hope that is backed up by an adoption of an elephant, in true Bolt fashion. That way our grand-kids will have something to pat. It is the Giraffe Manor kissing haven that gets me every time. That tongue is too long, and for some face licking that goes on the gram, it seems like a lot. Priceless memories, I suppose. Then again this could all be jealousy because I have never dropped a pin or put up a picture from that long-tongued beauty, have you? Good job to you if you have been to the place. For the rest of us may the trumpets of a thousand elephants wake us at 1am when we see that Ellen DeGeneres beat us to it. The woman got a nature reserve for gorillas in Rwanda as a gift for her birthday. It’s only natural that her first stop would be breakfast with the bold giraffes. Meanwhile a young woman is looking for a man with a Range Rover or Prado who can feed her. Is that his gift to you? Probably not. Does he even conserve, bro? Mother Nature scowls at you. Whilst we bask in undeserved glory of touching wildlife only on our birthdays, maybe, there are remnant options to annual celebrations, for those who don’t have nature reserves tacked to their names. And I assure you, they’re just as breathtaking, and just as important. Running a marathon – or let’s be honest, a half marathon – will make sure that people like me (the unfit who walk instead) get to continue enjoying wildlife. That, my friend is how people get to heaven – sacrificing their sweat, literally, for heaven on earth. 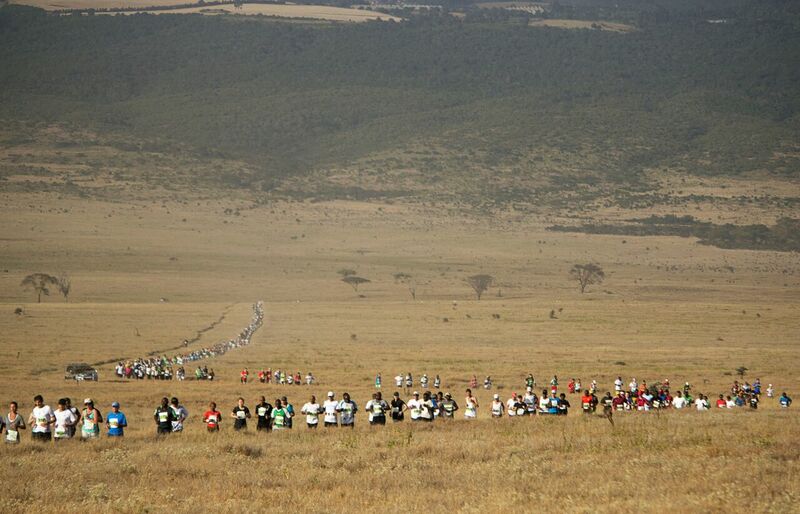 The annual Safaricom Marathon happened inside Lewa Conservancy last Saturday. For nineteen years people have been signing up to run this marathon in an attempt to raise funds for preserving the future of our wildlife and neighbouring communities. It is all fun and games until you realize that they will be there sweating alongside wild animals! What is wrong with just sending MPESA and tweeting your support like a normal African, I wonder. After all, si maisha ni MPESA tu? I also noticed that even the children are doing more than I am for the environment. They have a 5KM fun run and with all the bananas, oranges and water to fuel their energetic bodies, they should be fine. Start them early, I always say. Side bar, I would probably the mother who lets her kids do the fun race and then they can pass out on the way home and hopefully till the next day. That way I can sneak in an episode of Undesignated Survivor i.e. me. It’s a great strategy, if you think about it. I didn’t run the marathon, as you can probably tell, but, fortunately, you don’t actually have to run at the marathon. You can take the supporting cast role, and watch people with better hearts than yours run past you as you’re envious of all the scenery they’re going to see, as you try not to let your envy show. Now those are my people. The ones who encouraged the people saving rhinos and forests. Behind every successful runner, there is a cheering audience. But next year! Next year we will stand and be counted. Training begins this week (aki stop laughing, I am serious). We can start 10 crunches for day one, and build up, like the social media fitness buffs. After 10 o’clock tea, of course.